This is true. Five in the morning is too early to eat for me. By noon, when the market ends, however, I cannot seem to get food fast enough. The struggle is real to be surrounded by food. All morning I’ll eye people carrying a variety of fresh fruits and vegetables. Add to that, that my neighbor has gorgeous asparagus. And you know it’s good because he sells out by 10:30 every weekend. All morning my brain races with dishes I want to make. I am constantly conceptualizing. And talking with people who stop by my booth, typically leads to more food conversations (I am a baker, this should be expected). I am talking and creating at the same time. My excitement for a new recipe grows as the day goes. When I was brainstorming Easter recipes I had thought asparagus tart. And every Saturday as I sit next to my neighbor I think: asparagus tart. Finally we bought some asparagus. And finally I have made a tart. There are some vegetables, which are so good, I could eat them all the time. One woman claimed that by the end of asparagus season, she is over asparagus. Blasphemous. Sushi. My friends and family love sushi. Every birthday celebration dinner? Yep sushi. Starting with my birthday November 24th, we then hit the sushi house for Tab’s birthday December 7th, and then another time for Chelsey’s on the 15th. Is it any wonder than that post-break-up Chels arrives at 10 pm declaring, “I want sushi.” Naturally Tab and I are going to do anything she wants right now. They close at 10:30 get in the car. With a time crunch I gaze at the menu, my eyes make a beeline for beef negimaki. Note I’ve never had this, but for some reason I was getting a gut feeling to go for it. “Waiter I’ll take the beef negi…however you it.” Oh I was not disappointed. 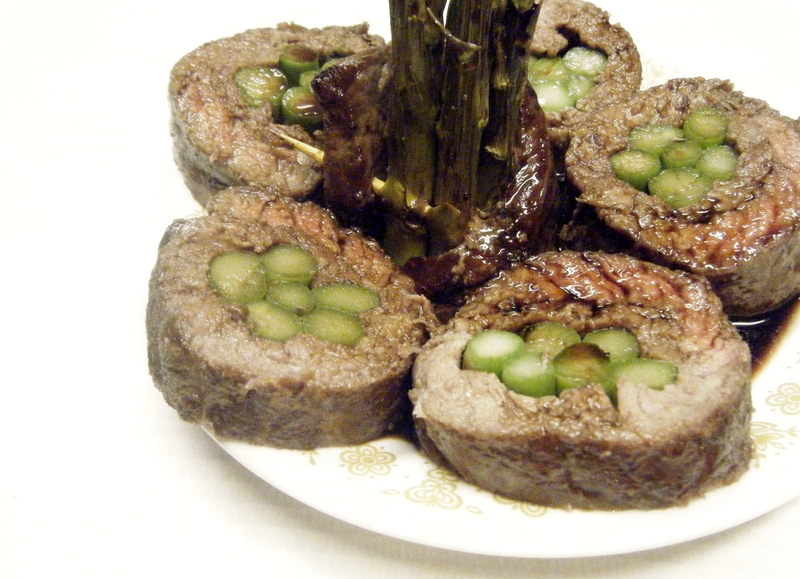 I normally get sashimi and I don’t eat rolls with rice, so this beef wrapped asparagus, which appeared at the table resembling a roll was winning. Normally my friends are always trying to check what I’m eating, nose crinkled up. Hmm…so eating something resembling theirs, I felt like I fit in at the dinner. Granted I was the only one eating seaweed salad (what can I say I love it). Naturally I walked away thinking: I’m going to make this at home, I’ve got to share this!